Comes with free wooden Mallet stick and Silk cushion. This Tibetan Chakra Singing Bowl Set consists of seven gorgeous golden Chakra singing bowls. The singing bowls range between 5″ to 10.5″ in diameter and with the A to G sounds for their playing notes. Each note attunes to a Chakra. These bowls sing very easily, producing rich, harmonic and soothing sounds and tones which last for a long duration. 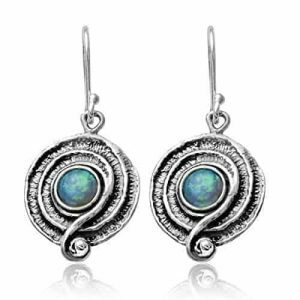 Together they produce energetic vibrations and it is these sounds that trigger chakra balancing and bring a senseof harmony. The tones of the Tibetan Chakra Singing Bowl Set enable you to rid yourself of pent up emotion and unwanted negative energy. 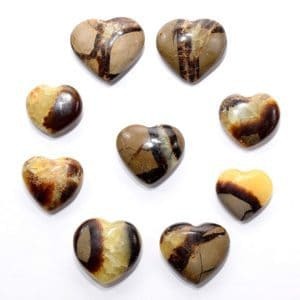 This allows you to relax, stress free and feel at ease. 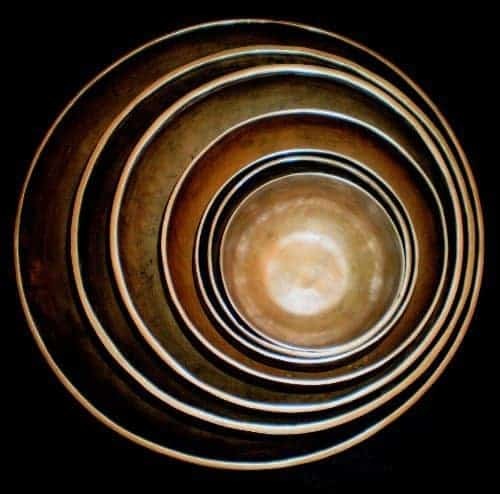 These singing bowls have been used for meditation, music, relaxation, personal well being, healing and chakra creation balancing for generations. 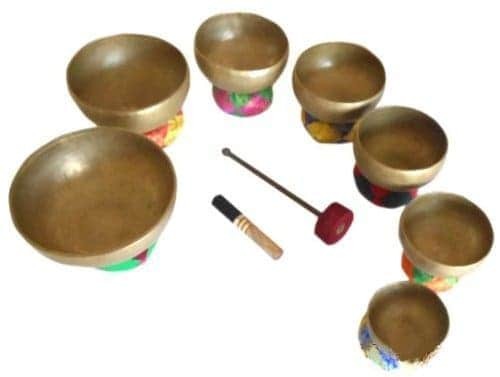 Tibetan Chakra Singing Bowl Sets are used by a wide range of people, including health professionals, school teachers, musicians and spiritual teachers. 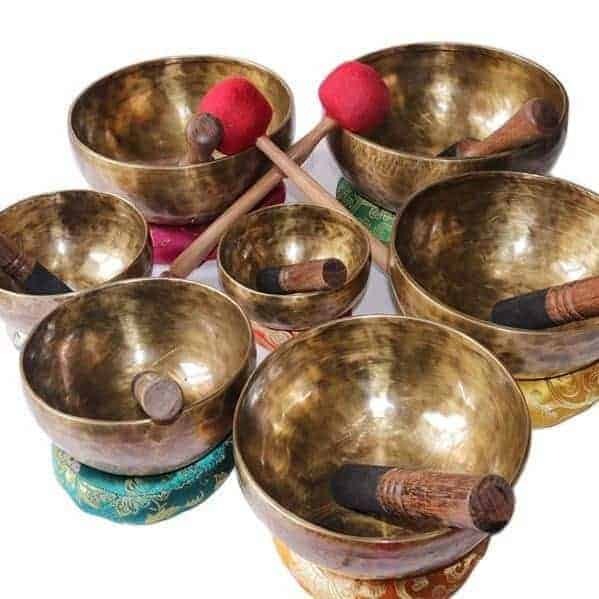 Singing bowls are used in health care by psychotherapists, massage therapists and stress and meditation specialists. They have been researched and their results proven extremely effective for people suffering from post traumatic stress disorder. They are popular in classrooms to help facilitate group activities and focus students’ attention. 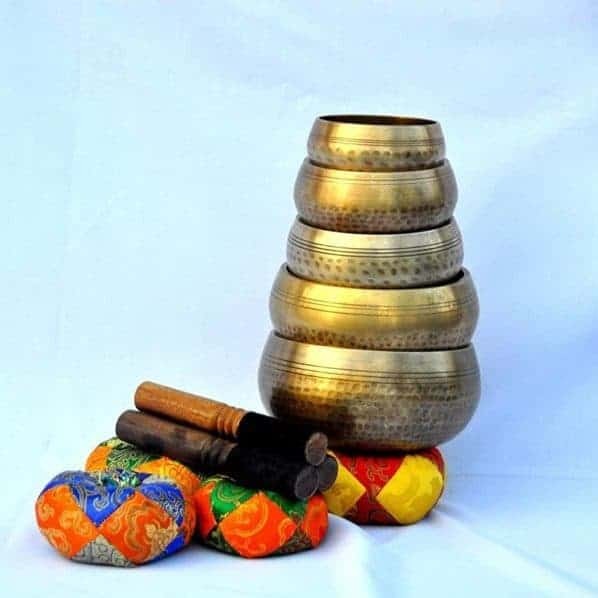 This set of singing bowls were hand-crafted in Nepal and includes seven singing bowls and seven strikers (mallets). The set also includes one Gong Striker and seven silk cushions. Simply by using the mallets in various ways … tapping ,rubbing, swirling … the sound of the singing bowls has a soothing, relaxing and healing impact on an individual. This is why so many sets are now used therapeutically. Each singing bowl is connected to one the bodies major chakras, based on the Buddhist Tantric System. 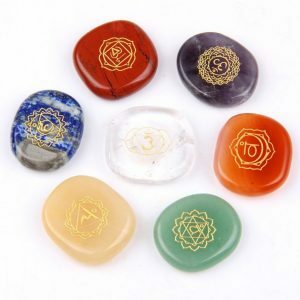 Chakras can be referred to as our ‘power supply’ or ‘energy centers’ of our body. 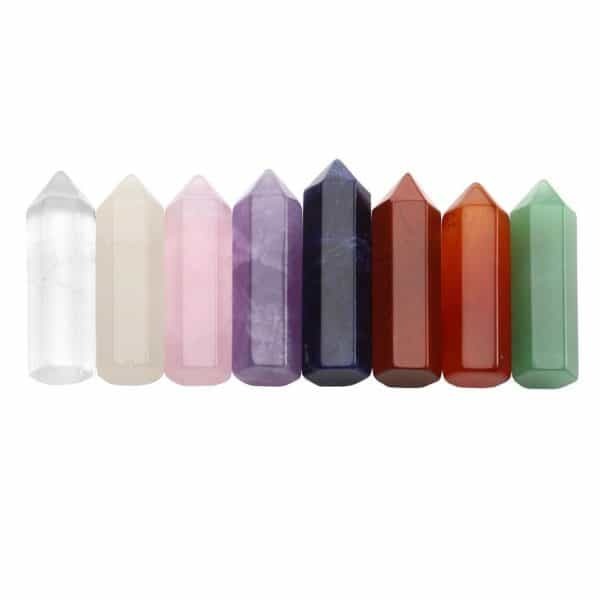 Each chakra has distinct energies and properties, and our body uses their specific energies for certain human functioning and health. Each of the chakras energies corresponds with a certain tone of the musical scale. The notes of the bowls correspond with each of the significant chakras. Using the singing bowls helps to remove blockages and energy imbalance by restoring the Chakras natural vibrations. The tones of the bowls acts as a tuning fork, enabling your chakras to re-calibrate and to clear and become balanced with one another. 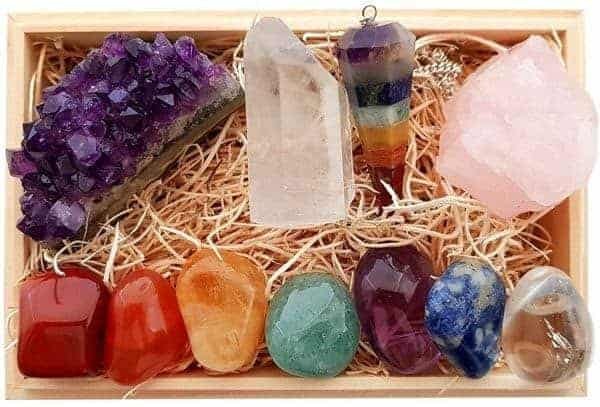 When your chakras are in balance you experience wellness and harmony in life. Please note – These are handcrafted bowls therefore each one might have slight variations in measurements given. Love this set of Singing Bowls. The price is amazing for the set. Always try to buy verified unique Tibetan singing bowls as there are many that are mass produced and don’t have great “singing” qualities. These bowls made from7metals are terrific and their healing properties well documented. I would love if they were a slightly bigger, in dimension, set…but then the price would be much larger also! Truly amazing singing bowl set. 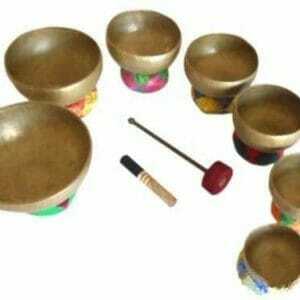 Very rare to find authentic Tibetan singing bowls of this quality at this price!